Puget Sound will be flooded past human memory during the hour of the shift, due to water pouring in from the compressing Pacific, which will take time to drain, and water from torrential rainstorms pouring into the sound from the rivers that empty into the sound. Surrounded by mountains, residents in the area should seek high places but be mindful of tidal bore, which can astonish those unfamiliar with what water will do under pressure and with no place to go but up. After the shift, due to higher sea levels caused by the melting poles, the sound will increase in size, giving better access to the Pacific for good ocean fishing. Puget Sounds is a geologically complex area, with many faults. 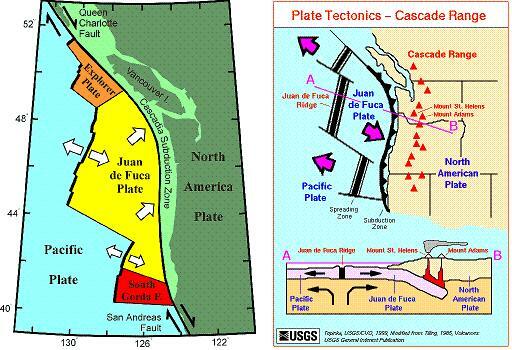 The Juan de Fuca Plate is pushing under the region, creating the belt of volcanoes in the Cascade Range. As the Juan de Fuca Plate is moving northward as well as subducting under the N American Plate, Vancouver Island is moving north, and is expected to move up to 100 miles further north during this coming pole shift. What will the pole shift mean for Puget Sound, beyond what we have predicted for pole shift tidal waves up to 600 feet high and rising seas - a loss of elevation of 675 feet within 2 years following the pole shift? Due to the complexity of the sound, with so many islands and peninsulas, there will be a baffling effect from any tsunami coming in from the Juan de Fuca Straits. This will help disburse the 100 foot tsunami expected to bore through the straits, swamping Victoria, especially as the tsunami will blow both north and south after leaving the straits. 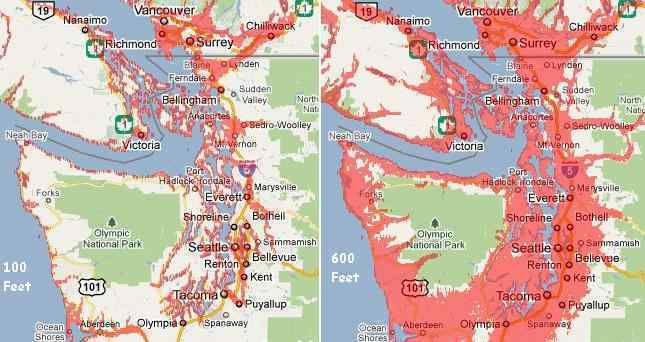 Despite cities like Seattle and Vancouver, BC being below a 100 foot elevation in the main, these cities are unlikely to be swamped by the tsunami coming from the great Japan quakes. But for the pole shift tides matters will be different. These tides are anticipated to be 500 foot high, with an additional 100 foot in height when tidal bore factors are present. Most of Puget Sound is lowlands, so much so that the entire region can be expected to be flooded during the hour of the pole shift. Where a single tsunami wave of 100 feet is expected to disburse, the pole shift tides are the entire ocean on the move. Lots of water, so that the whole coastal region is presented with water at this height. Tidal bore will occur in the narrow Juan de Fuca Straits, but this time not disburse. A 600 foot high tide will wash down into the sound, and up along the Washington coastline before dropping to a 500 foot level.